This is an incomplete game, inspired by Sabotage on the Apple ][ that I started work on back in 1984 or 1985. I was able to rescue the source off of one of my old 5.25” floppy disks. I discovered that I really disliked comments back in 1984, so I’m having a difficult time figuring out what the heck I was doing, but on the other hand it’s only a 3k game so there’s not much there. Notice the temporary sprites that I copied from various other games! 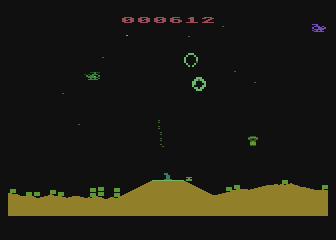 Graphic Violence by Tom Hudson supplies the explosions, although note that this game uses graphics mode 7+ (ANTIC mode 14) and Graphic Violence uses graphics 7. I think I may have done this myself: hacking Graphic Violence to double the height of the pixels in the explosions? It’s certainly quite different from the original code in ANALOG #8, so I guess it’s pretty likely that I am the culprit.